It’s been a long time since a game came along that tickled the same neurons as Minecraft. And by “a long time” I mean “never”. Oh sure there are the great builders – the Sim Cities and the Civilizations of the world, but in terms of sheer mechanical, constructive gameplay, Minecraft stands alone, and since I haven’t even scratched the surface of redstone I suspect it will keep on giving. The premise is simple: you’re alone on a hostile alien world, everyone else is in orbit, and they’re waiting for you to make it safe. The world is full of the usual resources: iron, coal, copper, lumber, and it’s up to you to gather them, craft them, refine them and defend them. Then you use those resources to research and build better technology which lets you gather and refine and research and build better technology which lets you… ad infinitum. I mentioned above the world is hostile, which brings us to the Biters, a hive-like indigenous that don’t take kindly to your colonial ambitions and your polluting ways. These grow in numbers, strength and complexity as the game progresses, forcing you to keep an eye on your defences, base layout, resource allocation and research choices. It shows every sign of one of those skilfully executed games where massive complexity and emergent behaviour comes from little more than the combination of simple elements into something cyclopean. Just like Minecraft. Whether the game can sustain itself and draw me back in like Minecraft does remains to be seen… I rather suspect it can. There’s a demo available, or you can just buy the game directly. 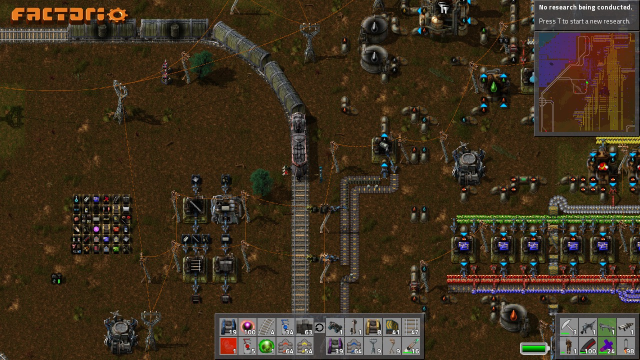 Following a successful Indigogo campaign last year, Factorio is now in late alpha and still in active development.